Hello, I'm Tigger! That's T-I-Double Guh-ER! I've been around since 1988, when Lee gave me to Laura on their very first trip to Walt Disney World. I didn't do any travelling until 1997, though, when Laura and Lee started going on trips in honor of their 10th wedding anniversary, and took me with them. This is where I get to tell *my* version of our trips - and I think I actually have the most fun. If you have any comments or suggestions about my web site, please sign my guestbook at the bottom of this page. 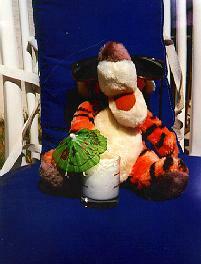 Or if you'd like to know when I update my page, please send an email to tigger at lgil dot net. Here's a list of my travel reports - the most recent appear first. Copyright © 1997-2009 by Laura Gilbreath. Feel free to link to this document, but you may not redistribute it in any form without the express written consent of the copyright holder.